Bubble Snooker is a game that combines the best features of Bubble Shooter, Pool, and Arcanoid. 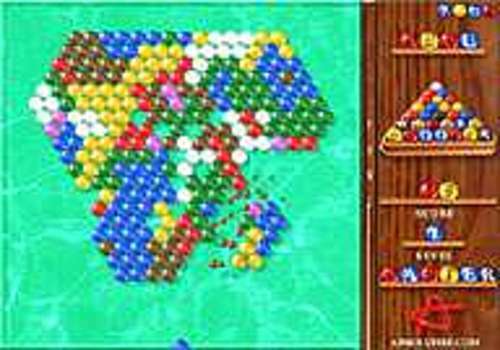 Your task is to remove the balls from the pool-table by shooting at them with the balls of definite color and combining together 3 or more balls of the same color. If the shot was unsuccessful, additional balls appear on the hexagonal net following the rules of John Conway's Game of Life. The balls that do not have neighboring balls (single balls) are removed from the table. When all the balls are removed you go to the next level. If the balls of the definite color are removed from the table, this color will not appear again on this level. The game is over if one or more balls touch on the lower edge of the table. In case the shooting ball strikes against the lower edge of the table, the colors of the balls on the field are substituted for accidental colors (including already removed colors). On the right there is a cue which serves as the indicator of the power of shot: the more it is pulled out upwards the stronger the shot is and the farther the shooting ball gets between the balls. For every removed ball you get 1 point on the 1st level, 2 points on the 2nd level and so on. Be very attentive and do not leave the "islets" of balls close to the lower edge of the table because after 2 or 3 misses the islets can grow and some ball will touch on the lower edge of the table (that will lead to the end of the game). The winning strategy is to play from the cusions not letting the balls fill in the whole table. Try to remove at least one color from the very first shots. Do your best to make the winning combination (2 or more balls of a definite colors together) for all colors be available at all times. Good luck!